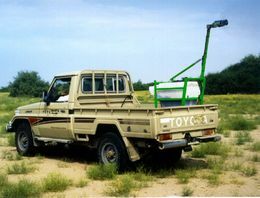 The Ulvamast V4 is the latest generation vehicle mounted ULV sprayer for control of migrant pests such as locusts, grasshoppers and armyworm. Thanks to its CDA (Controlled Droplet Application) technology, Ulvamast V4 produces evenly sized droplets of 50-100 micron to deliver highly effective and efficient spraying. 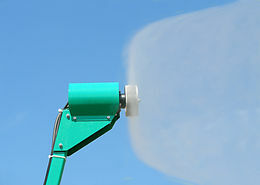 Spray volumes are typically 0.5 - 3.0 l/ha. 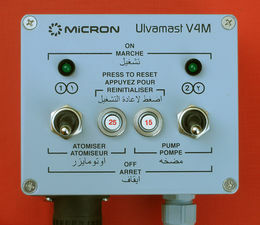 The Ulvamast V4 incorporates a Micron AU6449 rotary atomiser, a 100 litre tank, in-line filter and pump. It also has a number of innovative features such as a folding mast with locking extension arm, and stainless steel braided PTFE line hose pipes and comes with a choice of standard or electronic in-cab controller to regulate the flow rates. Electronic controller (in cab) and a choice of ten pre-set flow rates from 0.2 – 1.5 litres per minute. Standard in cab switch box to operate the Micron AU6449 rotary atomiser and pump with flow rate control via in line orifice restrictor plates. Frame Strong 30mm and 40mm box section mild steel. Folding mast and support arm. Nylon coated.